I saw the new X-Men movie this weekend with my family. I really liked it (and now have a bit of a crush on Michael Fassbender), although I will admit that my knowledge of the X-Men mythology comes mostly from the movies, so changes they made from the original comics doesnt upset/distract me as much as it does the real fans. In addition to giving the supposed history of the beginning of the X-Men, it offers and alternate history idea for the Cuban Missle crisis. What if there were someone pulling the strings to bring Russia and the United States to the brink of Nuclear War? What if they wanted that war? The boys and I talked a little about this (at 11 and 8, it’s a little too serious for them), but they liked the idea of changing the reasons or backgrounds of history. – something from history happened/ended differently? – something from history had a completely different reason from what we thought? – something from your personal history never happened or ended differently? 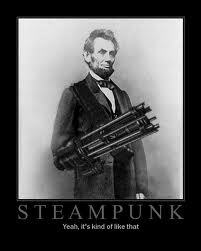 Steampunk is practically an entire genre of alternate history, and it’s popularity is growing fast. 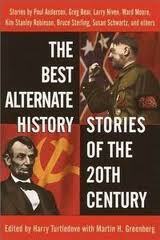 What’s your favorite alternate history book or story?